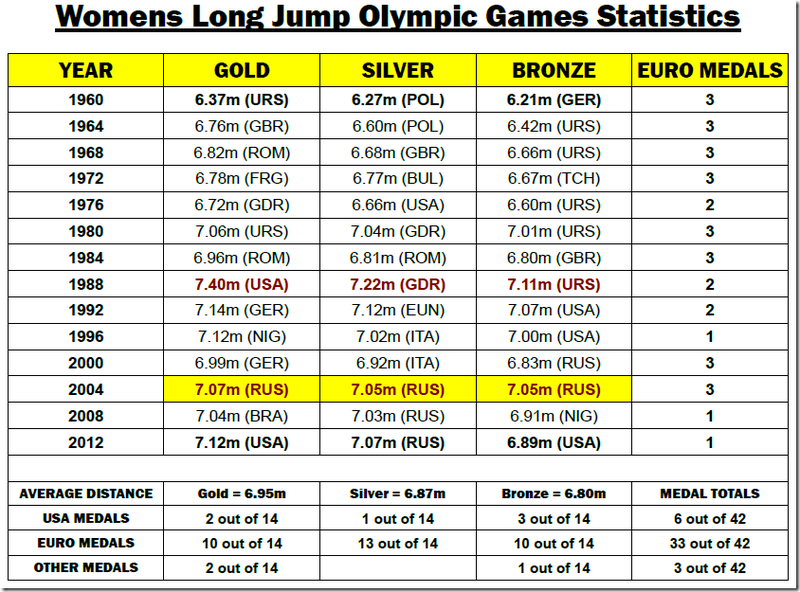 See Part 1 of The Complete Guide of Long Jump Statistics. Ian also wrote Michael Johnson Deep Dive, an in depth look at his performances and splits, and the Complete Guide to 4x100m Relay Statistics. 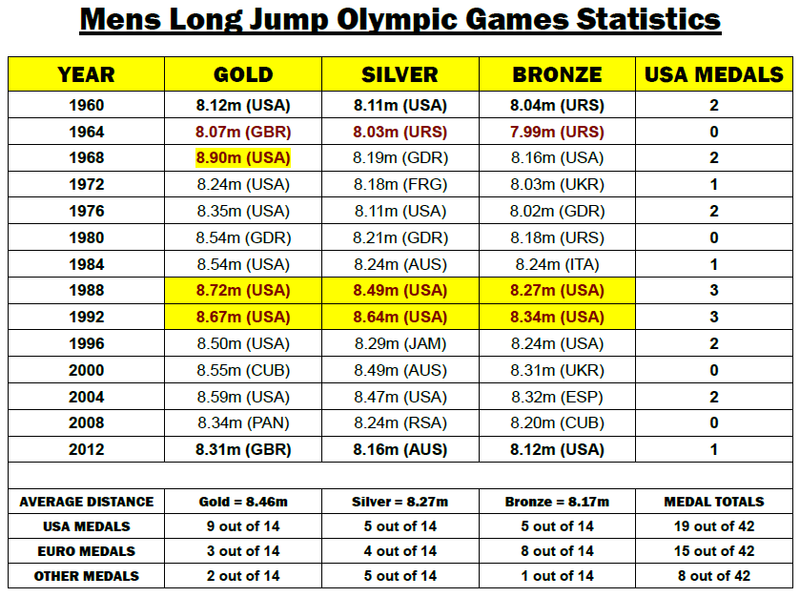 In Part One, I primarily looked at the men’s event and relevant statistics. 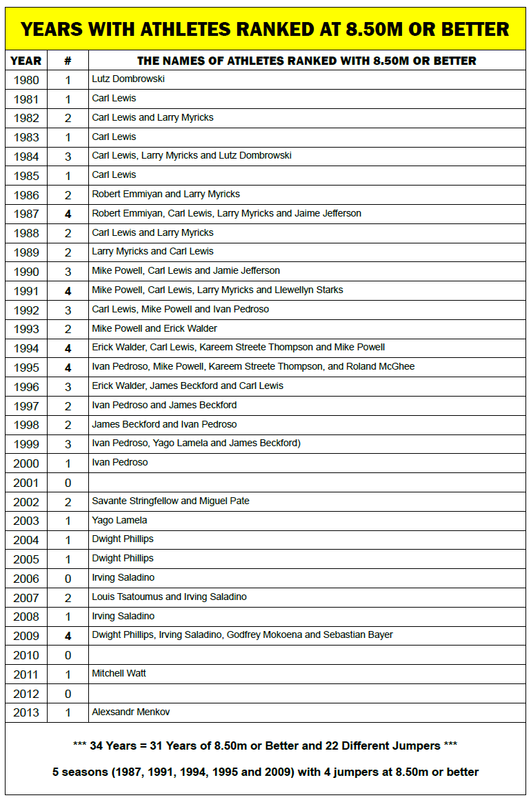 Here in Part two I am going to look at the women’s event, championship performances (Olympics, Worlds, Europeans) in both the men’s and women’s events, and take a closer look at Carl Lewis and Heike Dressler’s performances. 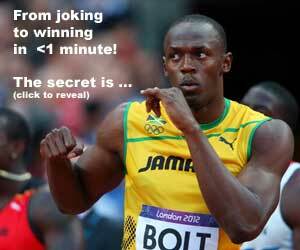 Note: That’s a total of 70 wind-legal jumps of 7.25m or better. 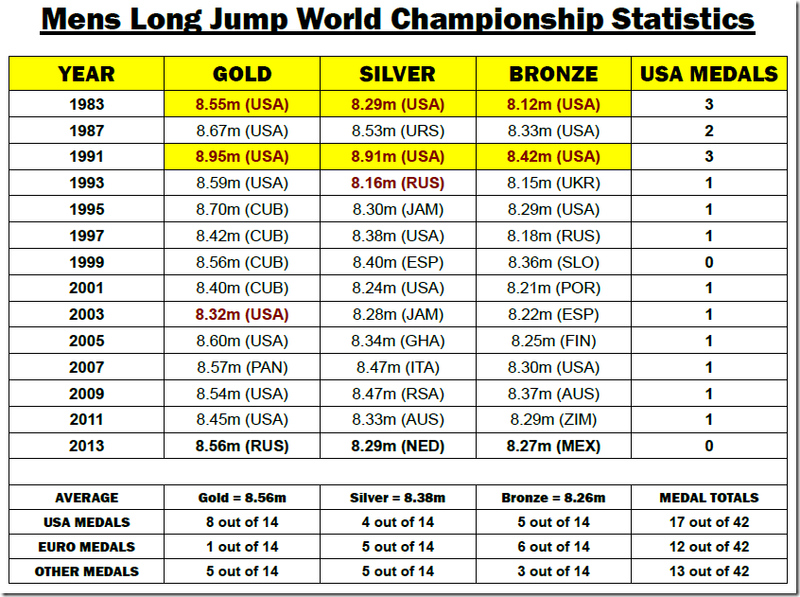 The USA clearly dominates the mens all time lists for the long jump, with 11 jumpers over 8.50m out of a total of 23 jumpers all-time over 8.50m. In the womens event, it’s the EUROPEAN athletes who dominate. 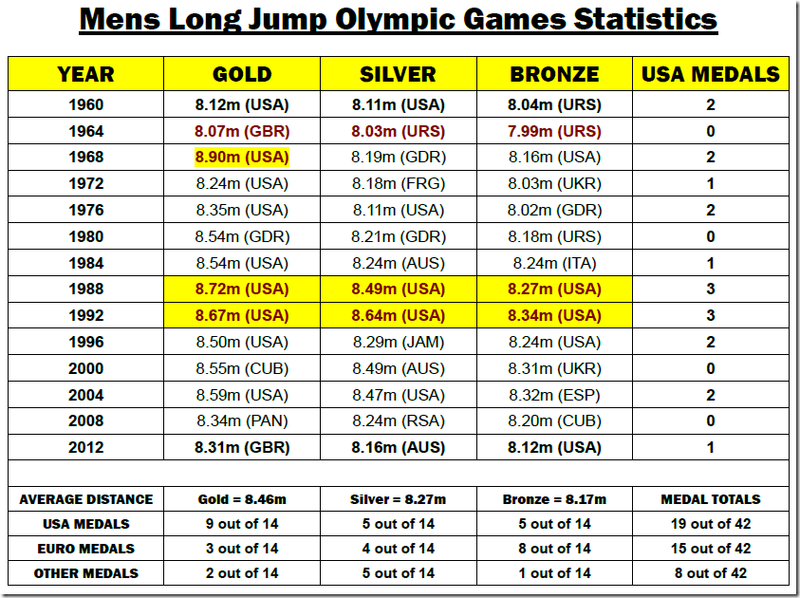 There’s been 68 women over 7.00m, 9 of them come from the USA, while 53 come from Europe. 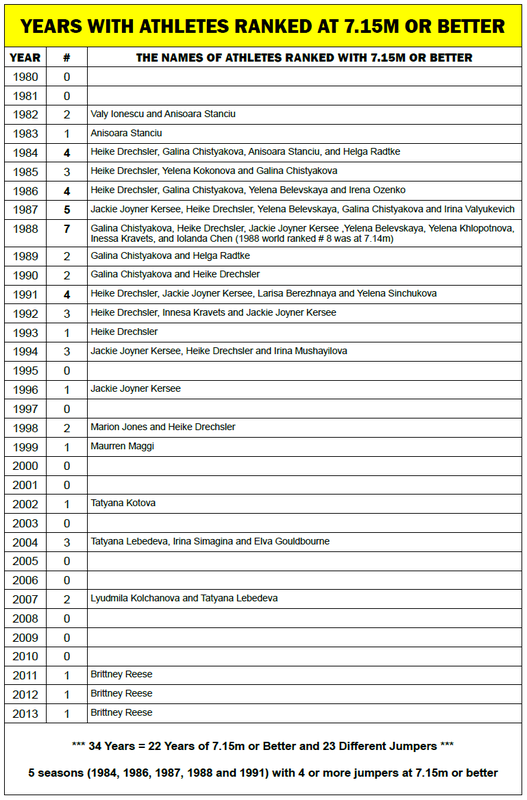 Of the all-time top ten female jumpers, only two of them have taken place since the year 2000, and both jumps were by Russian athletes (2002 and 2004). 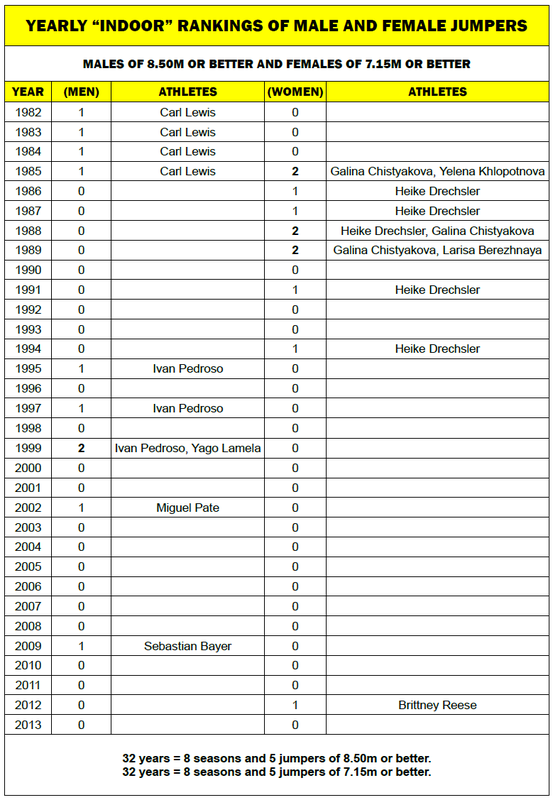 Top 3 jumpers all-time indoors are of the same nationality as the top three athletes all-time outdoors, GDR (Heike Drechsler), URS (Galina Chistyakova) and USA (Brittney Reese). The only woman with an indoor PB over 7.00m, who hasn’t jumped a 7.00m PB for outdoors is Dawn Burrell (USA – 7.03m Indoors). Dawn has jumped 6.98m outdoors. The only two men with an 8.50m or better indoor PB who has not jumped an 8.50m or better PB outdoors are Sebastian Bayer of Germany (8.71m indoors and 8.49m outdoors) and Miguel Pate of the USA (8.59m indoors and 8.46m outdoors). 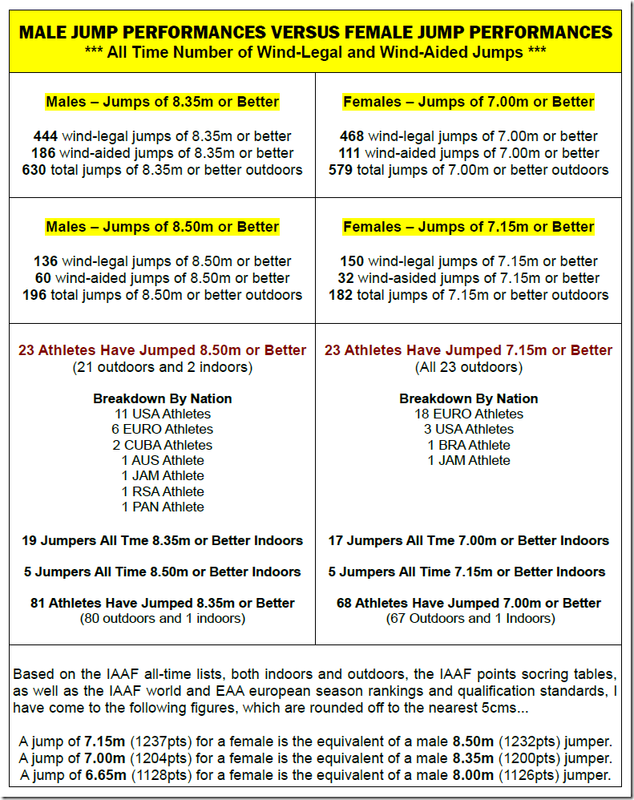 Interestingly no nation has ever clean-sweeped at a world indoor championships, in either the men’s or women’s event. There’s only been one women’s world indoor championships with a winning jump of 7.15m or better (Brittney Reese, 7.23m in 2012). Reese is the only USA athlete to have jumped over 7.15m indoors. Jackie Joyner Kersee and Dawn Burrell are the other two USA athletes who have an indoor personal best of over 7.00m. 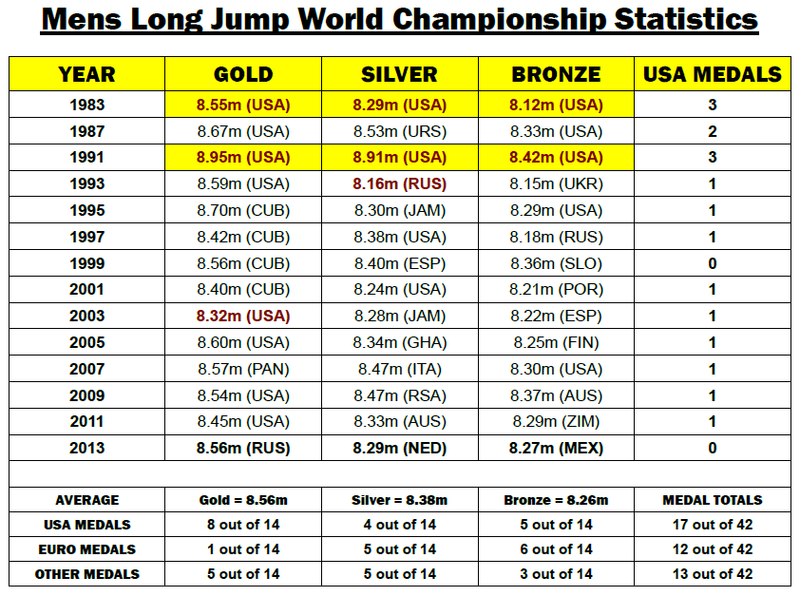 In the men’s event there’s been three world indoor championships won with 8.50m or better (1995, 1997 and 1999). In 1999 the silver medal was also won with a jump of over 8.50m (8.56m by Yago Lamela of Spain). The best winning distance at an outdoor European championships is 8.47m by Andrew Howe of Italy from back in 2010, which broke Robert Emmiyan’s 1982 CR of 8.41m. The best winning distance at a European indoor championships is Sebastian Bayers 8.71m ER jump from 2009. His 8.71m jump won the competition by almost 50cms (8.71m to 8.22m). Bayer (8.71m) and Lamela (8.56m) are the only Europeans to have ever jumped over 8.50m indoors, and both did it at a championship event. Heike Drechsler won 4 European outdoor titles in total (1998, 1994, 1990, 1986). Her 7.30m jump in 1990, still stands as the championship record (CR). Heike Drechsler was the first woman to jump over 7.00m at a european indoor championships, when she jumped 7.18m (CR) at the 1986 european indoor championships. At the 1988 european indoor championships, both Drechsler (7.30m CR) and Chistyakova (7.24m) jumped over 7.00m. 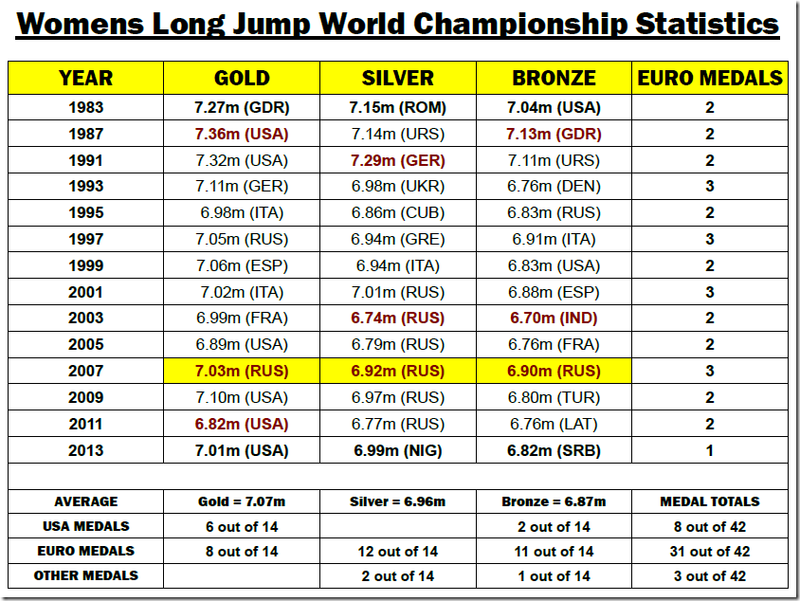 There’s not been any other championship with more than two medallists over 7.00m. 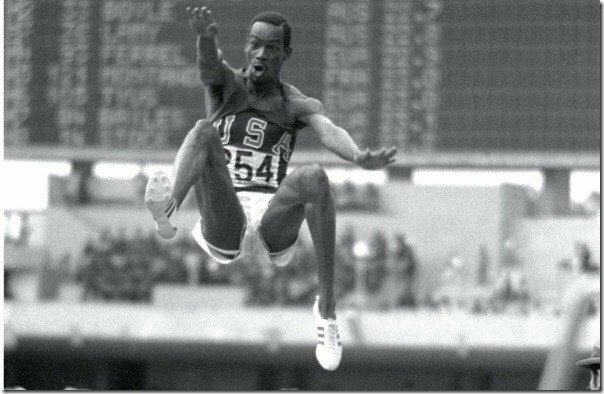 Bob Beacon’s winning jump of 8.90m won the 1968 Olympic gold medal by 0.71cms. The second place athlete was GDR athlete Klaus Beer, who jumped 8.19m. Ralph Boston of the USA took the Bronze medal with 8.16m. 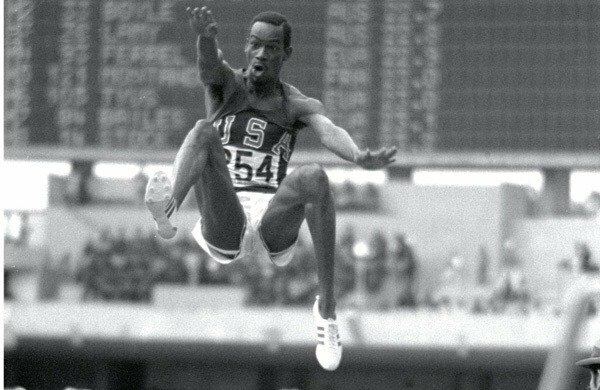 Ralph Boston won silver four years earlier in Tokyo, and four years prior to that in Rome 1960, he took the gold medal. In the first 3 world championship finals, there was 4 jumpers in each final over 7.00m, for a total of 12 7.00m jumpers in the first 3 world championship finals. 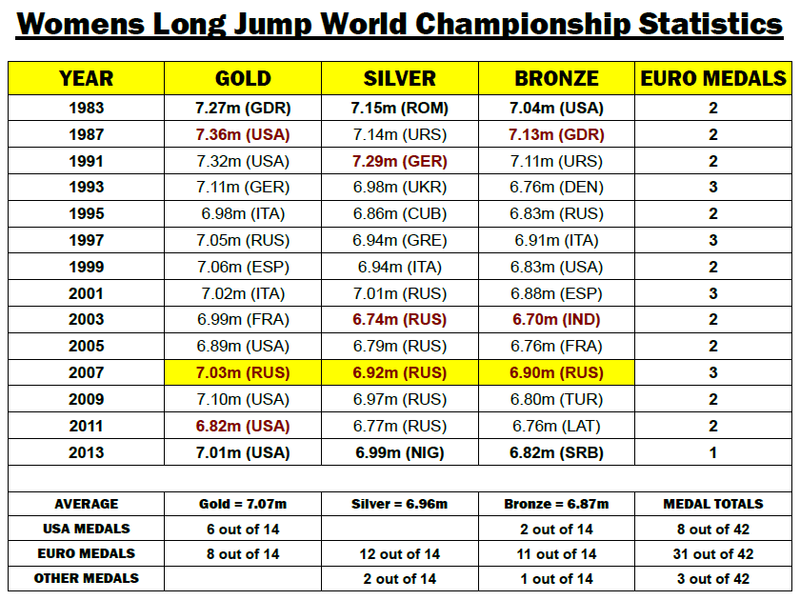 In the 11 championships since there has only been a total of 8 jumpers who have surpassed 7.00m in the finals. 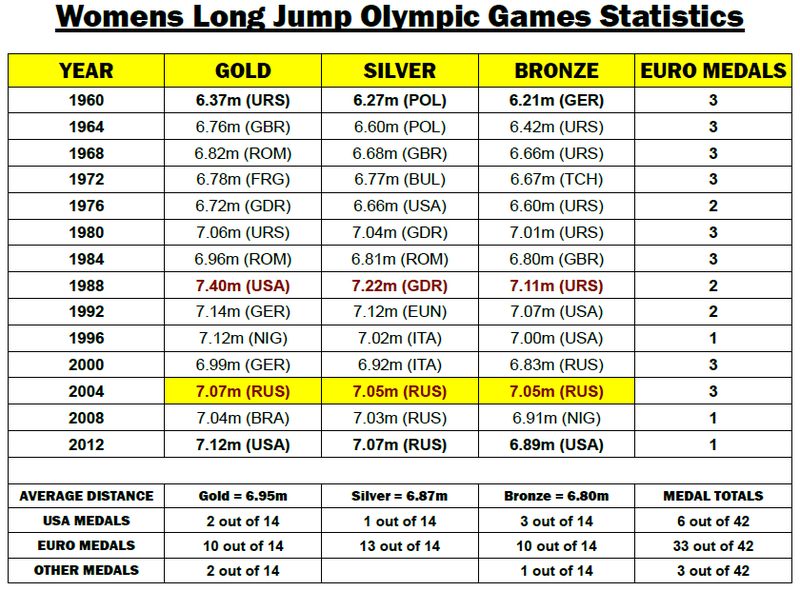 The winning bronze medal jumps from 1987 and 1991 would be enough to win gold in any championships since (1993 – 2013). 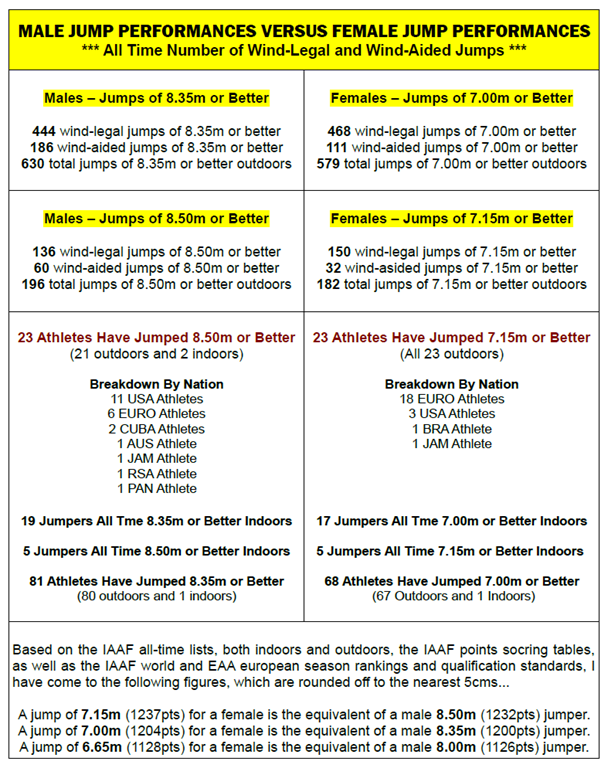 It’s also interesting to note that Heike’s indoor world record jump is 15cms short of the outdoor world record and 11cms short of her outdoor personal best, while Carl’s indoor world record jump is 16cms short of the outdoor world record and just 8cms short of his outdoor personal best. 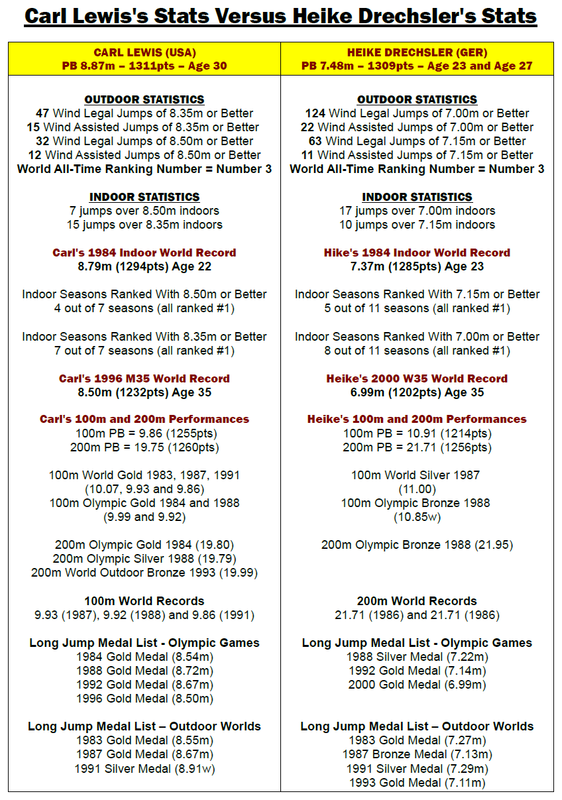 Carl had 13 years ranked with 8.50m or better, 10 of the years he was ranked at over 8.60m, and 6 of those years he was ranked at over 8.70m. Heike had 11 years ranked with 8.15m or better, 9 of those years she was ranked at over 7.25m, and 7 of those years she was ranked with 7.35m or better.